Turtle Pretzels are Sweet, Salty and Delicious. There is nothing better than a salty pretzel, dipped in melted milk chocolate…unless…you dip the pretzel rods in melted caramel first!! 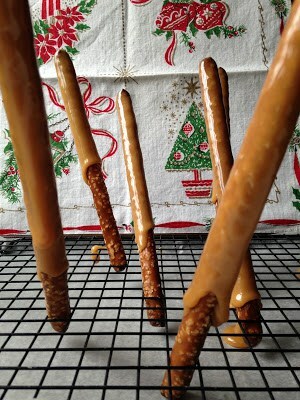 Dipping pretzel rods in melted caramel then dipping them in melted chocolate and covering them with just about anything you can think of, is a fast and easy treat to make during the busy holidays. Kids especially like to help make and eat these tasty treats. 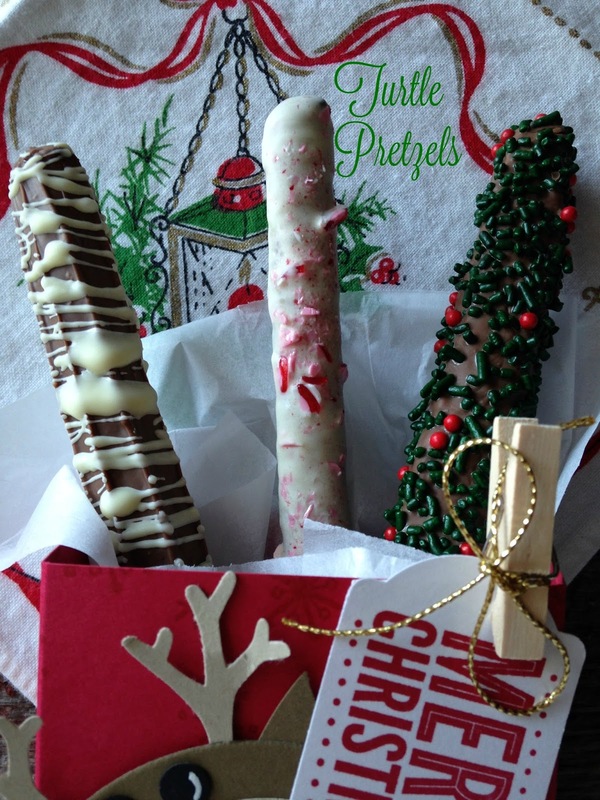 Dipping pretzel rods this holiday season? Try this handy trick; use you wire cooling rack as a handy “pretzel” stand/drying rack. 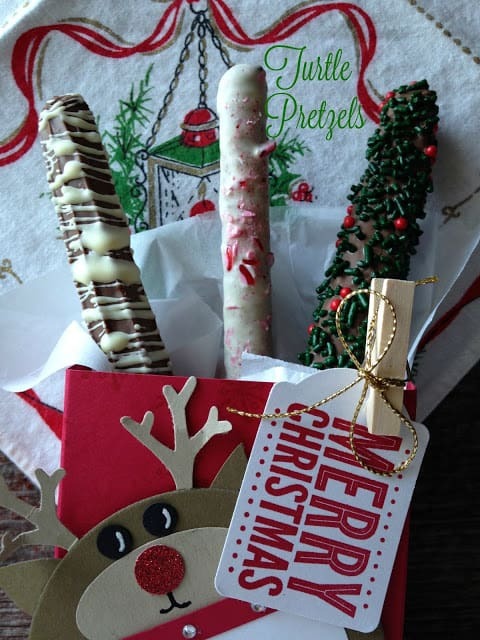 *see photos* My absolute favorite way to eat chocolate covered pretzels, are pretzels coated in white chocolate and then rolled in crushed peppermint candies. Line a baking sheet, one with sides, with wax paper. Place a wire rack (mesh-style) inside lined baking sheet. 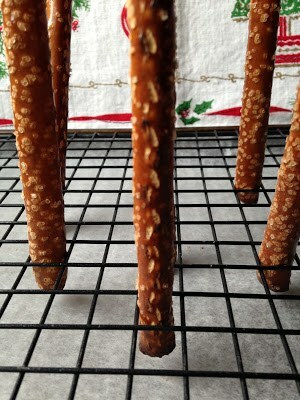 Carefully scrap salt from bottom of one end of each pretzel rod. 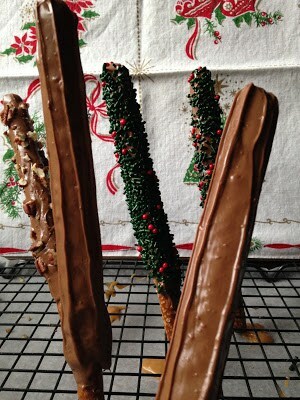 Holding on to smooth end of pretzel rod, dip pretzel rod into melted caramel and/or chocolate. 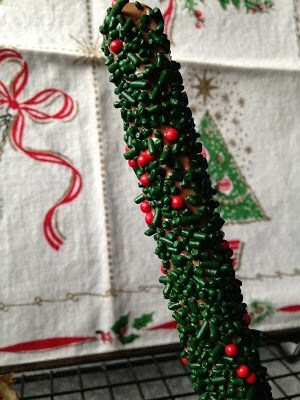 Stand dipped pretzel rod into squares of wire rack. Sprinkle or roll in sprinkles, chopped nuts, coconut, crushed candy etc. Unwrap caramels, place in a medium saucepan, add sweetened condensed milk. Melt caramels over medium-low heat until caramels are completely melted, stirring constantly. Hold one end of the pretzel rod, dip half of each pretzel rod into the hot caramel. 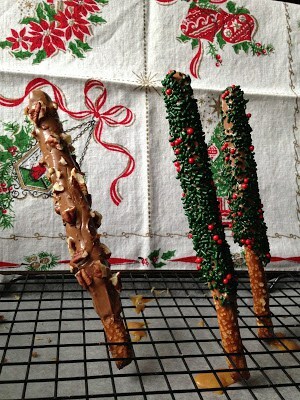 Spoon additional caramel over pretzel rod if necessary to coat evenly. Stand pretzel rods upright in small squares of wire rack to set up. Transfer milk chocolate chips into a microwave-safe bowl. Microwave on high-power, stirring thoroughly every 15 to 20 seconds. Repeat until chocolate is almost melted. (some pieces of morsels will be visible) Remove from microwave and stir until smooth. Dip caramel-coated end of pretzels into the melted chocolate; sprinkle with additional ingredients of your choice. Return to wire rack. When chocolate has harden, store in cellophane baggies. Melt white chocolate, in a microwave-safe bowl with shortening on high-power, stirring thoroughly every 15 to 20 seconds until chocolate is melted and smooth. 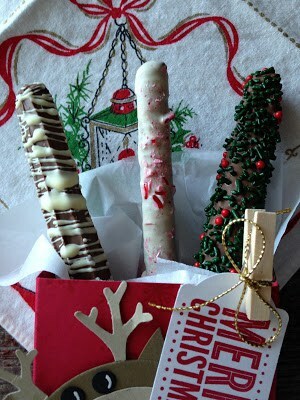 Dip one end of pretzel rod into melted white chocolate, sprinkle with crushed peppermint candies. Depending on how thick you like your chocolate, you might need more or less chocolate than the recipes calls for. 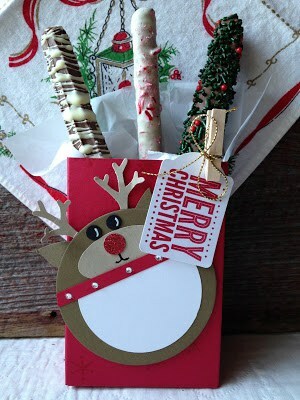 Holiday Mini Bag~ Stampin’ Up.